A remotely-piloted aircraft the size and weight of a laptop could malfunction in flight and kill or severely injure someone. Should such craft, popularly known as drones, be allowed over populated areas and who could be called to account for an accident caused by hardware or software failure? A concerned public is wondering whether a regulator should step in and lay down the rules. There is no guarantee that drone owners are competent to fly them and that the craft are airworthy. There is no authority to assure the public that imported drones, including cheap substandard Chinese ones and locally-assembled craft conform to product standards. What are the product standards, if they exist in Sri Lanka at all? Sri Lanka could get a handle on the situation by examining the European Aviation Safety Agency’s regulatory framework released last month. The agency has called for progressive and proportionate regulation. They propose safe distances from people, disallow flights above crowds and above 150 metres, and require that drones be flown within sight of the operator. The agency outlines three categories of operations and regulations for each category. Prudently, they believe that toys weighing less than 500g should not be regulated.Use of drones is widespread in Europe. In Sri Lanka they have taken off in the post-2009 years. 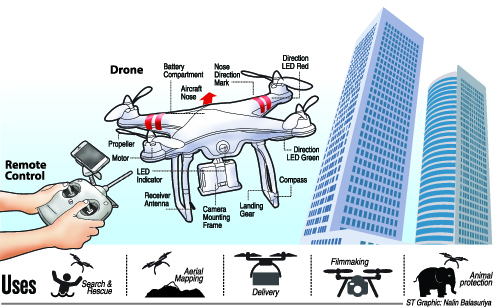 Unmanned aircraft of all types have been seen hovering over political rallies, are used to capture weddings, deployed for tourism promotion activities, and film making. The use of drones by individuals also opens a whole new debate on individual rights to privacy and even insurance cover. There is no way to eliminate risks entirely, but model aircraft hobbyists and authorised importers of drones favor a system of registration to begin with. Use of drones by civilians has raised fears over national security and public safety. Drones could be used in illegal surveillance, attacks, and reckless use near airports can endanger passenger flights. This week, five Chinese and a Sri Lankan were arrested for flying a drone opposite the World Trade Centre in Fort. In China, anyone flying a drone weighing more than 7 kilos must get a license from the Civil Aviation Administration. As yet, there are no comprehensive regulations on commercial drones. The Officer in Charge of the Fort Police, Chief Inspector S. Guneratne said the Chinese were released after they produced a document from the Ministry of Defence. According to him, the Chinese were tourists being escorted by a guide. “If they are using a drone over the city, especially in Fort and surrounding areas, it is necessary to obtain clearance from the Defence Ministry. We have copies of their passports and a copy of the clearance document,” he said. Drones equipped with cameras available in Sri Lanka range in price from Rs.50,000 to Rs 1 million-plus. Some carry 5D professional grade cameras. 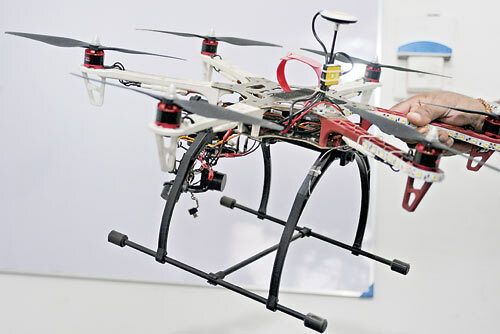 Cheap, China-made drones sell for between Rs.17,000 and Rs 25,000. Police Spokesman, Assistant Superintendent of Police, Ruwan Gunasekara, said there are no laws requiring drone operators to register, but Ministry of Defence approval would be needed for flights in former high security zones and in the city of Colombo.Police could act in the event of security concerns, or public nuisance, he said. A senior Customs official said Telecommunications Regulatory Commission approval is needed for remotely-controlled equipment. However, the Sunday Times learns that many craft are locally assembled using imported parts including cameras made by American adventure camera maker GoPro. A Telecommunications Regulatory Commission official said licences are issued for remotely- controlled model aircraft and toys. But the commission is only concerned with operating frequencies. According to the Civil Aviation Authority, approval is needed for remotely-piloted aircraft weighing more than 3 kilogrammes. Air Force Spokesman, Wing Commander Gihan Seneviratne, said the Defence Ministry consults the force to inspect and make recommendations . “There are many requests to use hexacopters for filming,” he said. Weight and size are regulated by civil aviation authorities, he added. “The Air Force can get directly get involved if there is enemy activity or a possible threat to national security,” he said. Sub-standard remotely-controlled aircraft and amateurs flying them could be a dangerous combination. “When a drone crashed into an army camp in Jaffna, we were able to track down the owner. It is important to have a registration system. No one would want an unmanned drone at a private party, or a hotel, or in extreme cases carry drugs into a prison,’’ Panditaratne said. He also suggests strengthening privacy laws. He said hexacopters fitted with cameras were first used at political rallies after they were imported by a leading sports channel. Now, these are widely used in some political gatherings. “There are multi-rotor copters such as quad, hex and octo [copters],’’ he said explaining that these have cameras with image stabilisers. Ruwan Costa, a pioneer in using camera-equipped drones for tourism promotion, points out that drones can be put to good use, but is concerned about sub-standard ones. Such craft can be used not just for commercial purposes but also during natural disasters, rescue missions, documentaries and research, conservation, wild life mapping, wild life conservation, and even oil and gas exploration, he explained. He also suggests that the civil aviation regulator formulate rules for drone operators.Bureaucrats should wake up to rapid developments in countries including the US, UK and all of Europe. If not, Sri Lanka may end up cleaning up debris left by drones gone wild and sparks could fly.